I love VG Nicki! 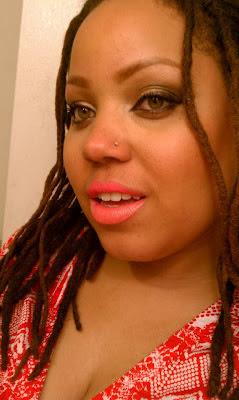 When I got it I wanted to compare it to another bright coral lippie, MAC's Flamingo (Iris Apfel collection) VG Nicki is on my top lip and Flamingo is on the bottom. VG Nicki is more richly hued and pinker. Flamingo's formula is lustre and more pastel in comparison. Do you have either? Which do you like? I don't have either but I'm leaning towards the Flamingo color =) but since that one probably isn't available anymore I'll definitely go buy the Nicki shade. Thanks for the comparison! I really really like the Nicki shade. I have VG Nicki and I have yet to wear it. hmm. Maybe this weekend!!! I like that shade on you - it has this cool neon quality to it. I like MAC for it's quality and the ability to make the makeup look very natural on my skin tone.I also think the colours that you are talking about are relative when applied on skin.For my skin MAC is very suitable.